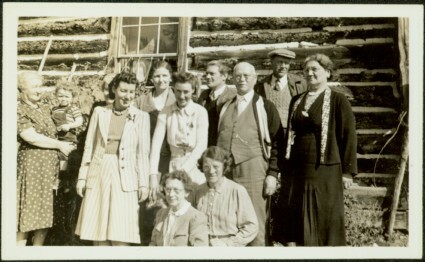 Group of eleven men and women stands and sits in front of log building. Woman on far left holds infant, Sarah Glassey stands on far right. Handwritten annotation on recto of photograph: "Mr & Mrs Conroy, daughter Mary & school teacher." Similar group also featured in items 2009.5.2.274 - 2009.5.2.294. Item is part of the Taylor-Baxter Family Photograph Collection. See also item 2009.5.2.285 for image featuring same location.